Check out the tips and improve your project! Grab Master Audio off the Unity Asset Store and use it for everything. Yeah, obviously we're biased (and shameless! ), but this is a super high performance audio management tool. The garbage collection allocation is simply way less than any other audio plugin on the Asset Store. In fact, there are zero bytes allocated for most calls. This means rock solid performance and predictability on mobile and other platforms. Don’t waste CPU cycles by using a less optimized plugin! Use Resource files for infrequent sounds, and music if you have more than a couple songs in your Playlist. Even streaming audio that isn’t being played takes up chunks of audio memory in Unity, so keep those audio files out of your Scene until you need them. Master Audio provides automatic Resource file loading and unloading to save on total memory usage. Delete any Unity audio filter FX that you aren’t using. All filters, even disabled instances in the Scene take up audio memory. Master Audio has a button to find them all and delete them instantly. Use lower sample rates for speech and other low requirement audio. Bulk resample your audio with the included Master Audio Clip Manager. Filter by folder or sound name easily. Set up and use "audio skins". Master Audio's Dynamic Sound Group Creator prefabs are great for setting up a variety of player or enemy sounds based on player type or other variable. These are also an easy way to set up temporary per-Scene playlists and sounds. Check out http://darktonic.freeforums.net/ for all the latest and greatest info, or get answers to tricky questions. And, of course, you can always email us at support@darktonic.com. 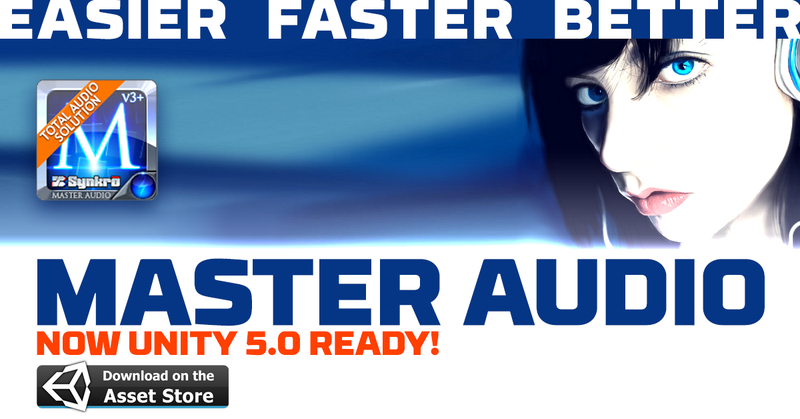 Did we mention it's fully Unity 5.0 ready? Get some!